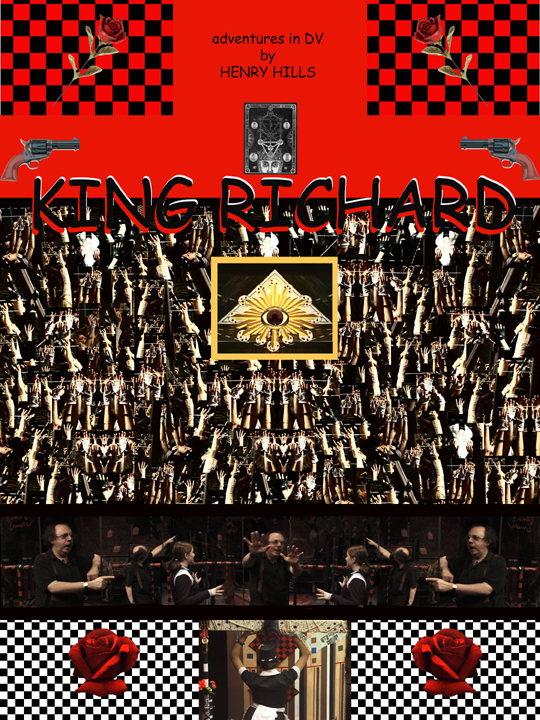 King Richard is a portrait of New York avant-garde playwright Richard Foreman in his Ontological-Hysteric Theatre. A charming yet revealing interview on the set by pre-teen protagonist Emma Bee Bernstein is interwoven with footage focusing on the periphery of a recent production--the elaborate set design and lighting, the non-speaking supporting cast (the so-called "stage crew") with their frantic movement patterns, typical props and recurrent imagery, all shot & edited in a disruptive manner to mimetically compensate for the loss of actual presence. Though it may sound odd for a work which has never left the digital realm, I think of King Richard as a totally hand-made piece. Probably because I fidgeted with it for so long, even carrying it with me on a LaCie drive whenever I left town. I had shot the interview in 1997 after a performance of Benita Canova and the performance footage not until the final dress rehearsal of Cowboy Rufus Rules the Universe in 2004. I first assembled them as two separate strands, suffering over every frame, tweaking density/saturation/contrast/brightness/direction/orientation, analyzing Foreman's rhythms and creating my own, building and eliminating patterns of repetition, downloading thousands of relevant images from Google, synching the performance footage to every combination of Foreman's sound loops on Ubu.com, expanding and shrinking my ingredients (like baking bread), then interweaving (like a tapestry), chipping away the unnecessary, to create the right nuance of movement and thought, emotion and motion.